Law school classroom lectures can leave you with a lot of questions.Glannon Guides can help you better understand your classroom lecture with straightforward explanations of tough concepts with hypos that help you understand their application. The Glannon Guide to Professional Responsibility is a clear, concise textbook on the important topic of professional responsibility in legal practice. Using the tried-and-true Glannon Guide format of topical explanation followed by multiple-choice questions and explanations of the answers, the book allows students not only to learn and review course content, but also to pass the Multistate Professional Responsibility Examination (MPRE). Chapters are arranged in order of how heavily the MPRE tests each subject to help students prioritize their review. Professor Stevenson, a tenured law professor at South Texas College of Law and a leading instructor in this field, has used his extensive experience teaching this course to develop a series of questions specifically designed to prepare students for the MPRE, and to provide thorough coverage of the ABA Model Rules of Professional Conduct. This study aid can be used with any casebook or course on professional responsibility. 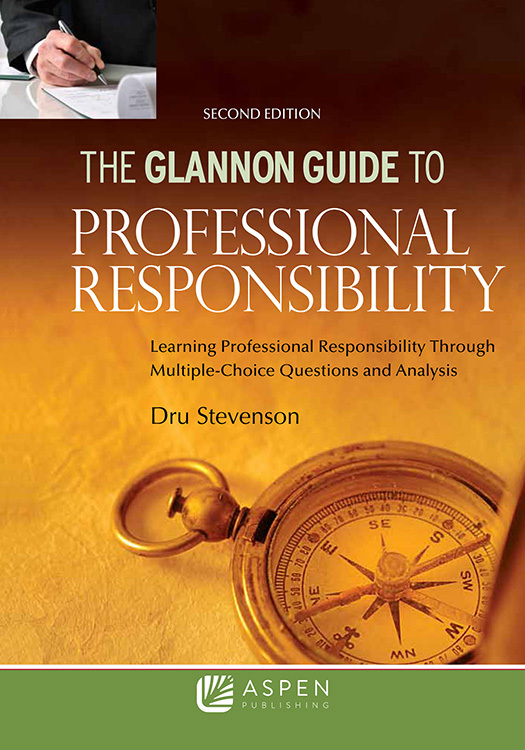 Following the format of the Glannon Guide series, this book features multiple-choice questions integrated into a full-fledged review of the Professional Responsibility course. Clear explanations of correct and incorrect answers help to clarify nuances in the law. The multiple-choice questions are sophisticated and neither too difficult nor too simple, with valuable exam-taking pointers interspersed within the substantive text. A more challenging final question at the end of each chapter (the “Closer”) illustrates a sophisticated problem in the area under discussion.